As the second largest state in the United States, both in size and population, Texas has a lot of nearly everything, including some 25 million people. Naturally, nursing schools in Texas are found throughout the state, at community colleges that offer two-year programs and at universities that grant four-year bachelors degrees, as well as masters programs, online degree programs, and more. Nursing is a career that has a promising future, as healthcare continues to be a growing need in society. Those that will do well as a nurse are people who have a calm demeanor in challenging circumstances, and people who love the chance to help others recover from illness or injuries. From the entry-level Certified Nursing Assistant (CNA) programs that can be completed in a few months, to Licensed Practical Nurse (LPN) training and Registered Nurse (RN) degrees, there are options available for every career path. Like many fields in medicine, nursing is becoming very specialized, especially in many large hospitals. Nursing students can specialize to learn much more about particular needs and work opportunities, such as cancer, burn patients, infectious diseases, surgical assisting, or many other specialty areas to advance their career and provide more unique care. Many nursing schools in Texas have advanced courses in a variety of special topics so that a student can focus more effort on developing further skills. In addition to learning medical-related subjects such as anatomy, biology, physiology, pharmacology, and more, additional coursework in nursing school will likely involve topics like record keeping, healthcare techniques, and biosciences. Many nursing school programs will include a substantial amount of clinical time working with actual patients as the students progress through the program to develop skills in real-world situations. For individuals who love to help other people, who like a job that requires them to think and solve problems, in a stable and growing field that pays well and is very respected in society for its valuable contributions, the job of nursing may be a very good career choice. How much do nurses make in texas? Nurses, generally earn more in Texas than most other states. For example, nurse midwives earned a median annual income of $97,090 in 2013 in Texas while nurse midwives nationally earned $92,290 for the same year. The same holds true for nurse anesthetists as well; they earned a median annual income of $154,940 in 2013, while nurse anesthetists in the rest of the country earned $151,090. Registered nurses (RNs) in Texas earn more than the RN’s nationally. For example, RN’s earned a median annual income of $67,310 in 2013 while RNs in the rest of the country earned a median annual income of $66,220 in 2013. How much does a nurse practitioner make in texas? 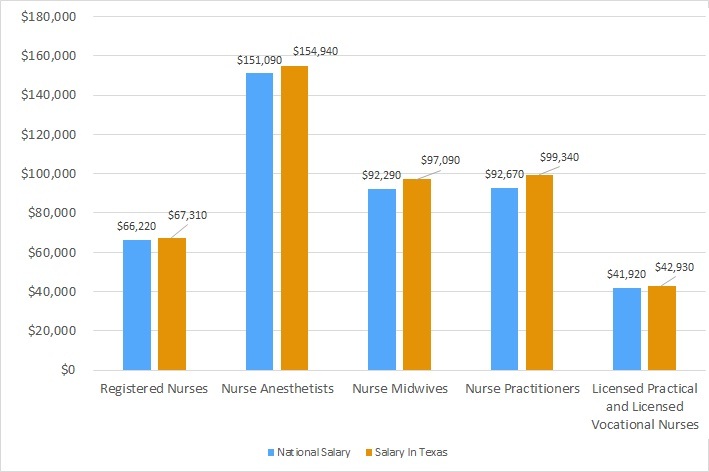 Nurse practitioners earned a median annual income of $99,340 in 2013 in Texas, while nurse practitioners in the rest of the country earned $92,670 for the same year. Q:What are the contents of the course on College Mathematics in the Nursing schools in Texas? A:The Nursing Schools in Texas have dedicated course on College Mathematics. This course usually is worth 2 credits in total. It is designed to provide students with strong understanding of the comprehensive mathematical reviews and skills that are needed at college level in the United States. Hands on experience is also provided in this course for better learning. Q:What factors should I consider when searching for the best nursing schools in Texas? A:There are a number of factors you need to keep in mind when searching for a great nursing college. It is obvious that you will want to make sure you receive the best quality education for a reasonable cost. Accreditation, costs, program curriculum, educational facilities, and student reviews are a few things you should go through before selecting a college for your education. Q:I want to increase my job prospects in the nursing industry as much as possible. What are the features of the best nursing schools in Texas so that I can get into one? A:The first thing that you have to understand about good nursing schools is that they have to be accredited. Secondly, they should be offering a full range of nursing specializations such as programs for becoming a licensed vocational or practical nurse, LPN to RN programs, BSN as well as MSN degree programs.